Great event overall w/great newspaper press (print + online) beforehand to help drive traffic to us, including some good press by the UTK daily email system, 'Tennessee Today.' Great weather! This is our more typical event MO: drop several vehicles into a large crowd and start talking. Probably 35,000-40,000 were in this busiest area around Neyland Stadium due to the Vol Walk (players and band come through during afternoon); we estimate we directly interacted with around 500 but WAY more than that walked by and looked into & saw vehicles. 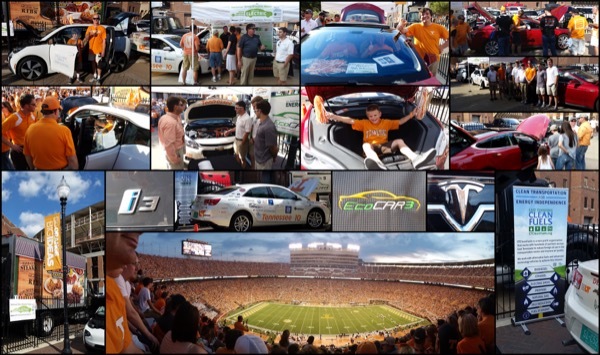 3 EVs there: BMW i3, Tesla & UTK's EcoCAR2 plug-in Chevy Malibu. About 10 volunteers helped through the 4 hours. *Event budget 98% our coalition staff time; we don't have paid time to do. Volunteer hours don't include our time. This should give you a feel for the whole event. A compilation of about 12 photos plus participant logos, and several photos show the #NDEW2015 banner that resided at the front of our tent and on a black fence behind our vehicles. GO VOLS & GO ELECTRIC! National Drive Electric Week is is a nationwide celebration to heighten awareness of today's widespread availability of plug-in vehicles and highlight the benefits of all-electric and plug-in hybrid-electric cars, trucks, motorcycles, and more. This year's events will fall between September 12-20 all across the country! 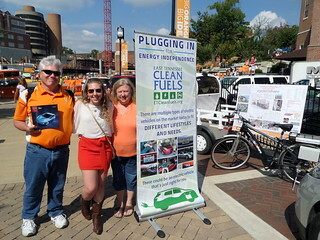 East Tennessee Clan Fuels Coalition will be hosting a National Drive Electric Week event at the UT vs. the Western Carolina Catamounts game. 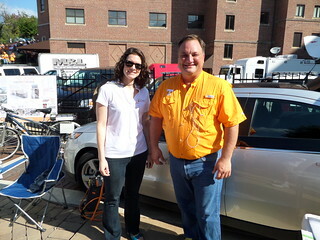 Join us at Gate 21 at Neyland Stadium for hands-on access to electric vehicles and educational information! Game time is 7 pm, but we will be on-hand a few hours before that. Gate 21 is directly accessible from Philip Fulmer Way. Please note that we encourage you to come to learn, visit, kick the wheels, or volunteer, but we will NOT have space for you to bring your EV. This is a closed space accessible by pedestrians only. Registered attendees report 57,481 electric miles driven.